AS IT STANDS: Clinton vs Bush in 2016? Oh, Hell no! 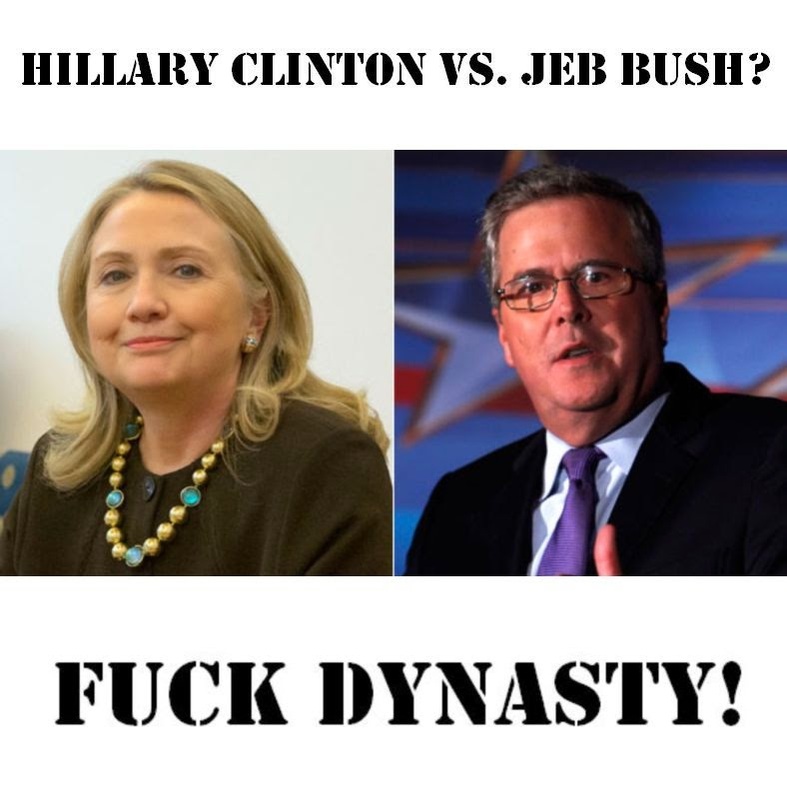 I’m against family dynasties monopolizing politics. A few select families have ruled America for decades.The Clinton, Bush and Kennedy clans turned running for president into a family business. “Five of the last seven elections included a member of one or both of the Clinton or Bush families as presidential nominees. If the 2008 Democratic primaries had turned out a little differently, either a Bush or a Clinton would probably have been president without interruption since 1989. If the worst happens and both dynasties take their parties’ nominations in 2016, the Obama presidency could end up being the only break that Americans have had in this cycle until 2024. That is ridiculous, and it is significantly different from the role previou s dynasties have had in our politics. It tells us a number of things about our political culture, and none of them is good. The first thing is tells us is that a politician’s dynastic connections now matter far more than his or her qualifications. If Jeb Bush weren’t the son and brother of former presidents, no one would seriously be talking him up as a plausible presidential candidate for an election ten years after he left elected office. If Hillary Clinton weren’t the wife of a former president, it is extremely doubtful that an unremarkable former senator and former Secretary of State would ever have been considered a prohibitive favorite for the nomination. For that matter, if not for their famous names and connections it is an open question whether either of them would have won statewide election in the first place. The harmful effects of this are more apparent on the Democratic side, where Clinton faces at best token opposition to a nomination that will be handed over to her as long she wants to have it. Even so, it is also quite harmful to the GOP, since the last thing the GOP needs is to relitigate and to defend George W. Bush’s disastrous tenure. If the party made the mistake of nominating Bush’s brother, that is inevitably what it would have to do. On top of that, nominating Bush would represent a decision to shunt aside an entire class of new political talent that has appeared in the last decade. Dynastic ties make it much easier for bad and mediocre candidates to compete for and even win nominations. That in turn produces worse general election choices and outcomes. Dynastic ties also allow inexperienced and unqualified members of the family to ascend to higher office because of a misplaced faith in the influence of other members of the dynasty’s retinue.